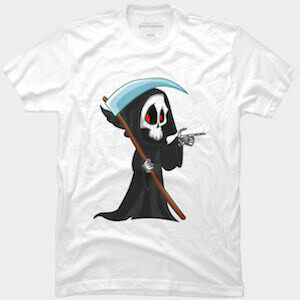 Now you can take death with you all thanks to this Grim Reaper T-Shirt. The t-shirt is available in many styles for both men and women and it comes in many sizes too. On the t-shirt you can find the Grim Reaper in his black robe and his skeleton body and red eyes and he is pointing ahead of you so maybe he has his eyes set on a new victim. And he did bring a freshly sharpened scythe so that he is ready to take a life. A t-shirt like this maybe a bit creepy and that will make it perfect for Halloween. Now there is a fun and spooky hug the grim reaper t-shirt. The grim reaper t-shirt is available in a bunch of styles for both men and women and it comes in many colors too as well as many sizes. 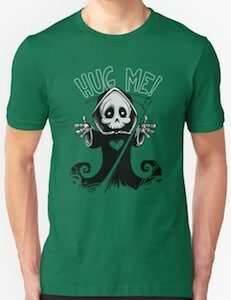 On the t-shirt you can see a reaper with his boney arms open for you and above the grim reaper it says “Hug Me!”. Personally I would not hug this fellow as we all know that that does not do you any good as he is death. A reaper t-shirt like this is great fun for Halloween or just a different day you like to have a spooky hugger on your shirt. 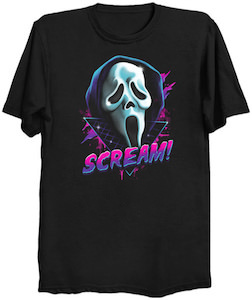 If you like classic scary movies then Scream was a funny one and now there is this Scream movie t-shirt. On the t-shirt, you can see the head of the famous grim reaper that was worn by the killer. Beside the reaper, it says scream on the shirt and all that in an 80’s look with fun colors and all that makes for a great t-shirt for anyone that like classic movies and Halloween. You can get this Scream t-shirt in styles for men and women and it comes in sizes Small – 6XL and all are made from 100% cotton.